It's About Time We Ate Those Carrots! March Comes in Like a ... Pig? 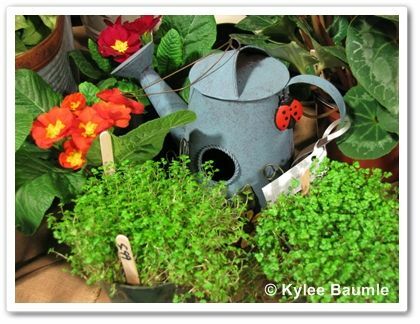 It's also time to think about what you'll plant in your gardens to attract the hummingbirds. They love red, which is why you see most feeders in that color. 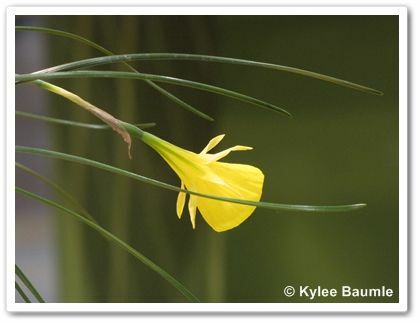 But they also know that yellow, pink, purple, and orange flowers have good nectar, too. 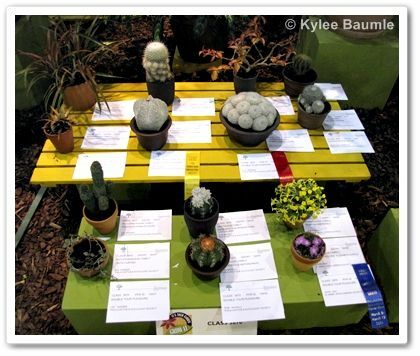 I spoke with Shayna Lashway, Marketing Manager for Botanical Interests, about how seeds are chosen for a collection, since there are so many that would work. 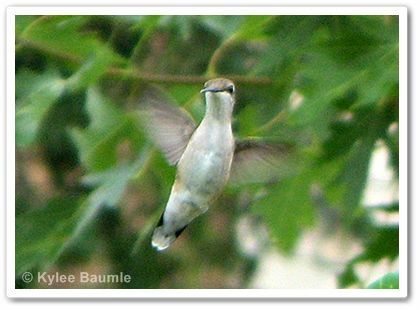 Regarding the hummingbird collection: "This collection consists of varieties that are known to attract hummingbirds. We also use our own experiences to help guide our selections. 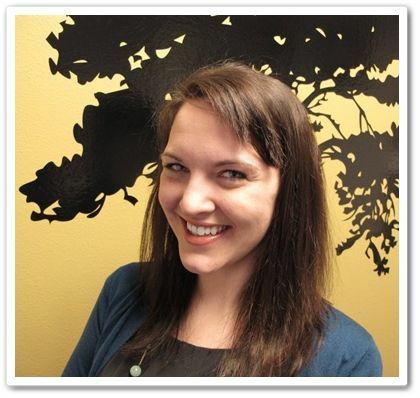 The process is a group effort, with feedback from our staff experts." I also asked Shayna which they sell more of - vegetable seeds or flower seeds. 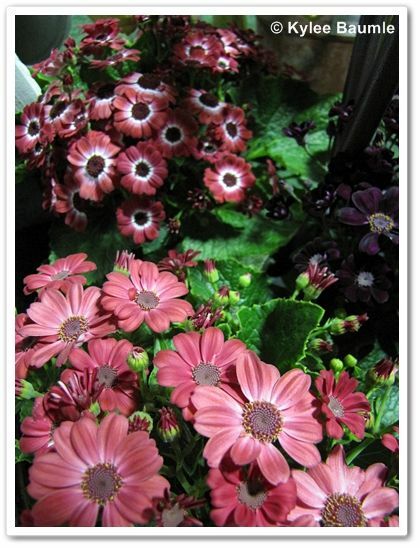 She said that though flowers sell well, they sell more vegetable seeds and those continue to gain in popularity. 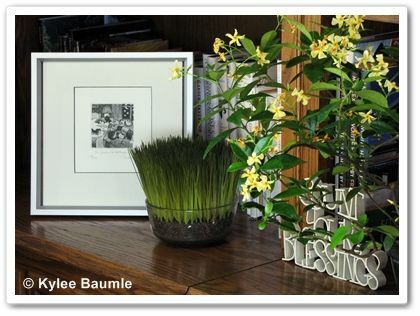 Her personal favorite of all the collections they offer is the Gourmet Greens Collection: "I just love greens! 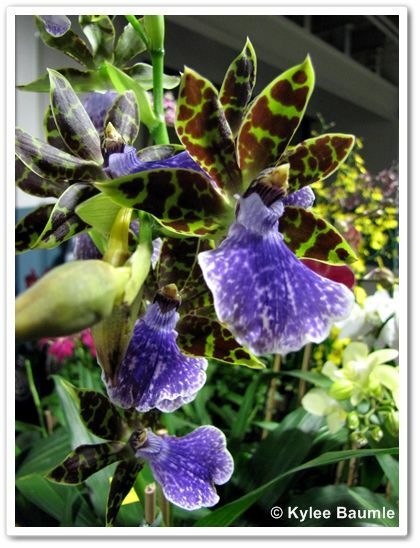 This collection has some really great varieties, and a nice assortment of flavors and textures." 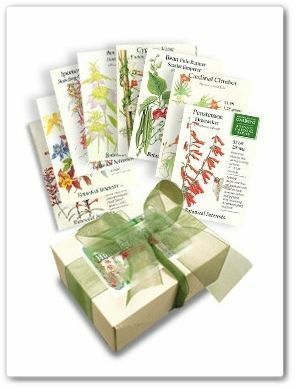 Botanical Interests is a kind of One Stop Shop when it comes to seeds. 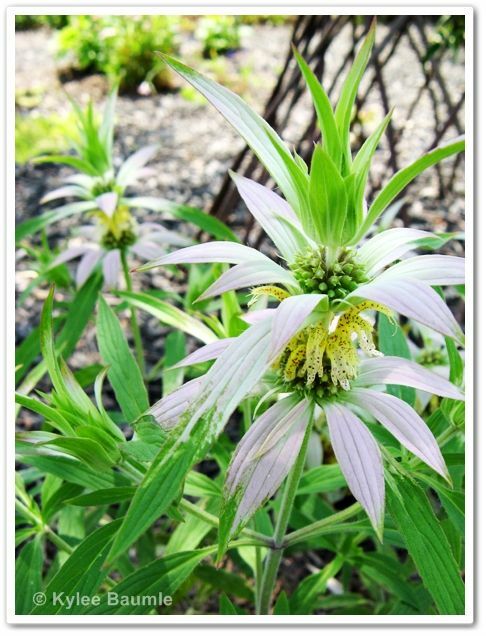 In addition to detailed information about their seeds (also on their seed packets), they've got several blogs connected to their main site. 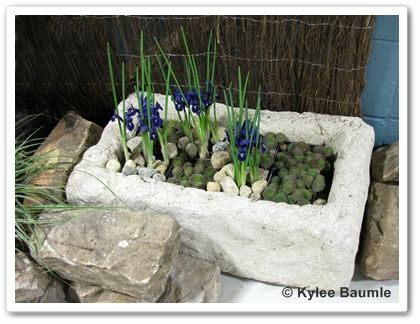 Be sure to check out Seed to Saucepan, Creative Inspirations, and In the Garden Virtual Gardening Coach. It's important to note that all of Botanical Interests' seeds are untreated and they don't sell any GMOs (Genetically Modified Organisms). If the winner of the giveaway would prefer a different collection, Shayna said he or she could choose the one they want. 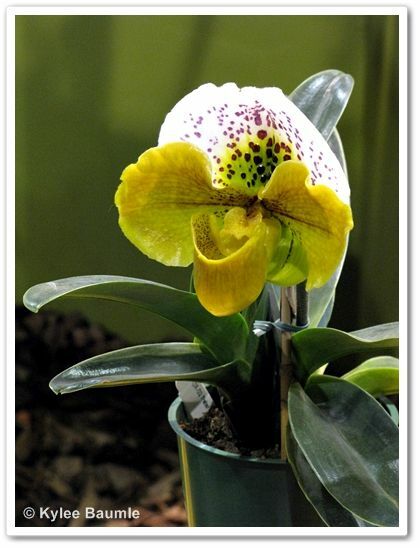 So, just visit the Botanical Interests website and look over the collections they offer. Leave a comment to this blog post by midnight, Sunday, April 3, 2011, telling which collection you'd like to have if you win. Be sure to subscribe to comments so you'll get the notification of who's the winner. 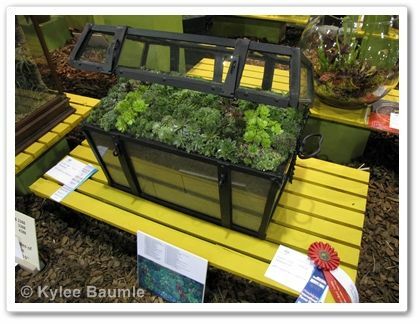 Thanks to Shayna and Botanical Interests for this wonderful jump start to the gardening season! 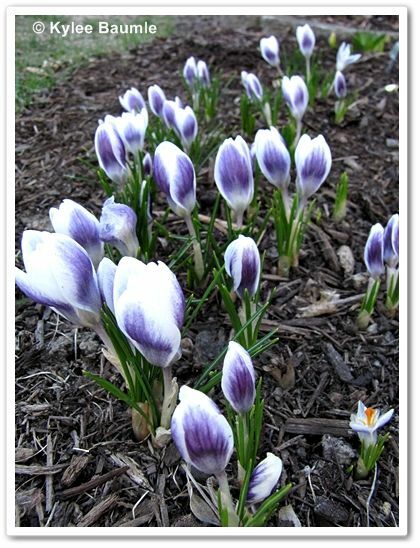 So says Debra Middleton (Aunt Debbi's Garden) on my Facebook page this week, as I was bemoaning the lack of spring weather. I had plenty of supporters of my point of view, which when you think about it, isn't really true. Spring is notorious for being fickle. One day it's so warm you're throwing off your jacket and the next day it's so cold you don't even want to go outside, even with a winter coat. But the gardeners ARE cranky. 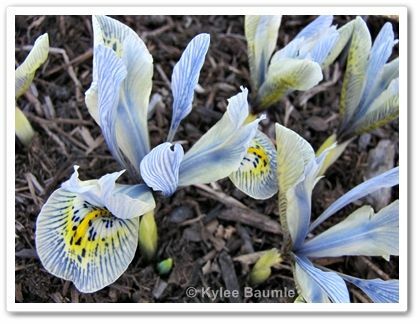 We see our beautiful early spring bulbs blooming and many of us have seen and heard the buzzing bees. The early migratory birds have been back for several weeks now and doggone it, we want warm weather! 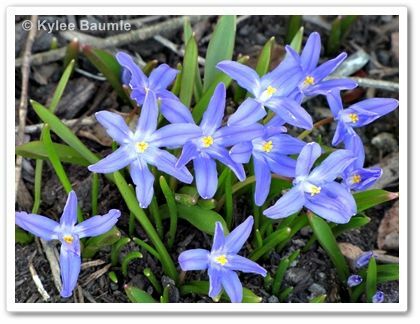 Instead of being grateful for these spring beauties, we grumble. It's no fun to clean up leaves and twigs and winter's messes with a drippy nose and numb fingers, let alone wake up to snow. 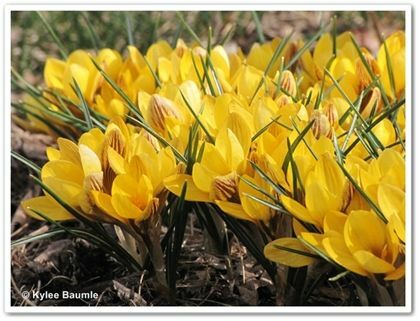 Each winter it seems like the season gets longer and longer and we get more impatient for spring. But the fact is, it will happen when it happens and there isn't a darn thing we can do about it. As my grandma told me yesterday, "God hasn't missed giving us a spring yet." That doesn't stop us from being cranky about it though. You know...misery loves company and all that. We really are impatient for the sore muscles and exhaustion that spring tasks bring with it. We're a strange lot, we gardeners, aren't we? As someone who is gaga for gardening in my corner of the world, I've been feeling a bit guilty about something. It's time that I come clean to my readers about something. I realize this confession might change how people think of me, but I'll feel better if I come clean. Now I'm not going to apologize for what I'm about to reveal, because I'm perfectly comfortable living this way. But gardening purists just might have a critical word about it. 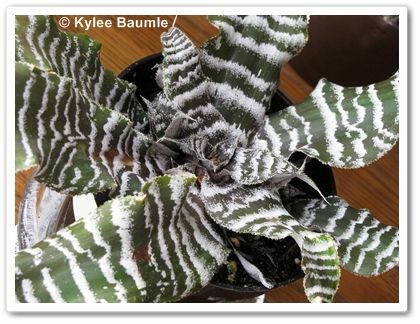 With over 1000 different plants in the ground here at Our Little Acre and more than 175 houseplants (winter population only), it may come as a shock to you that I have a nice little collection of fake plants. 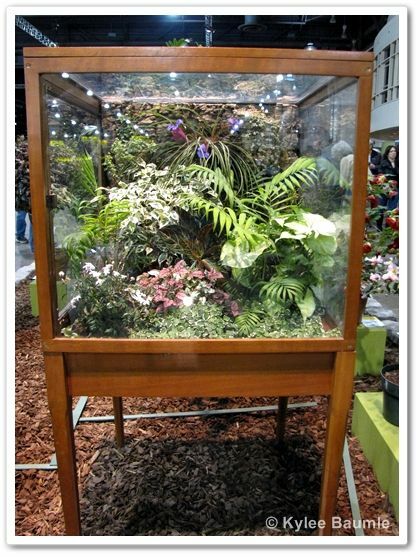 There are some situations where having an artificial plant makes perfect sense. 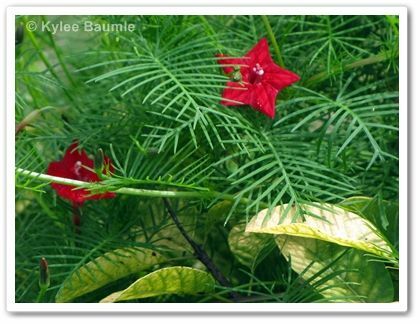 Sometimes it's a matter of "right plant, right place," just as it is in the outside garden. 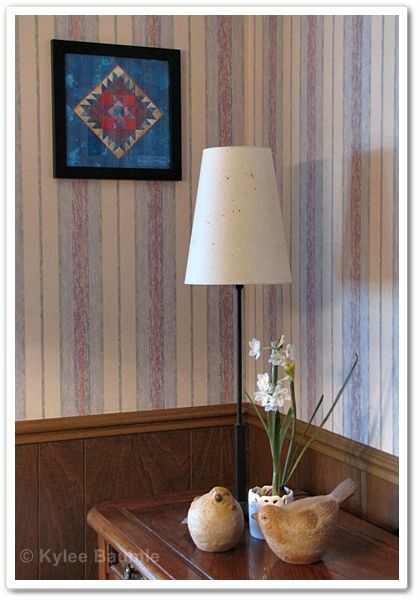 There are locations in our home where lighting is an issue. The eating area of our kitchen, for example, has no windows. 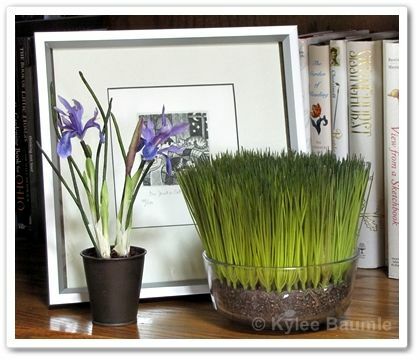 So, in spring, these Narcissus come out of storage and sit on the table until spring has passed. And then there are the plants that I either don't have access to, or that I have problems growing. Like agaves. 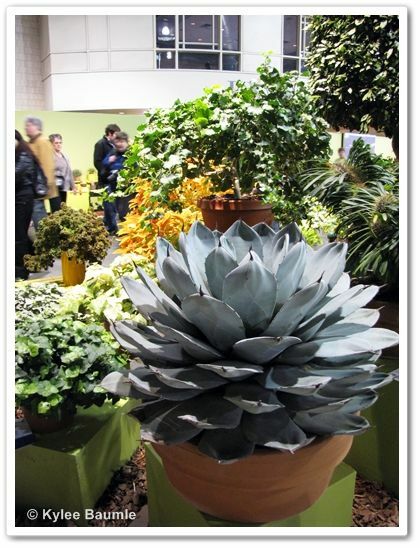 Ever since I saw Pam Penick's Whale's Tongue agave on her blog, Digging, I've been nuts for agaves. Oh, I've tried to find a large one here in northwest Ohio, but they're just not common. Even a smallish one is hard to come by. I finally found one in Toledo, at Hoen's Greenhouse, but it's only about six inches across. 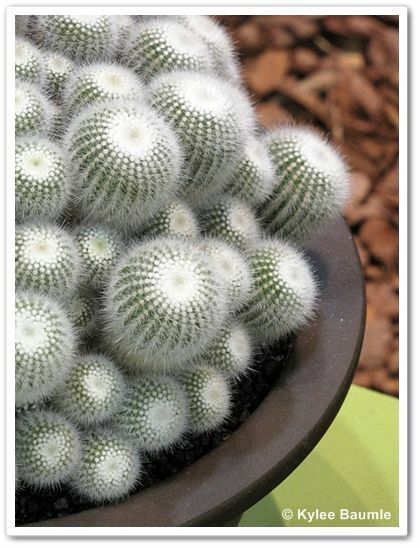 Of course, I bought it and I hope it grows well for me when it goes outside this summer, but I wanted one of the BIG ones. Joe Cooper, Florist, in Waterville, Ohio - an hour north of me - had the answer to my agave lust. No, it doesn't look identical to the real thing, but it's a nice fake and good enough for me. When I came across it on my way to Kate Copsey's house for my radio appearance on her America's Homegrown Veggies show, I snatched it right up. I even have a fake plant in the conservatory. 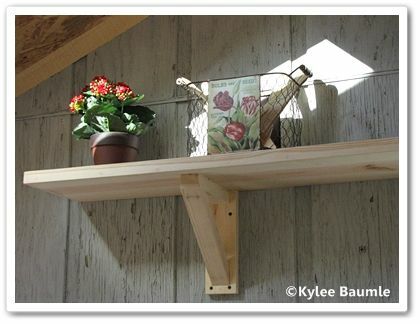 Up on the shelf sits a red Kalanchoe. Why would I put a fake plant out there? Because I thought it was a beautiful imitation. There. It's out in the open now. I feel better. 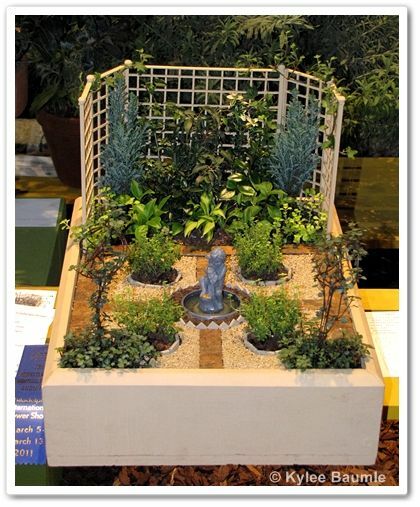 You may have noticed the Garden2Blog logo in the sidebar on the right side of my blog. Some of you may have even clicked on it. 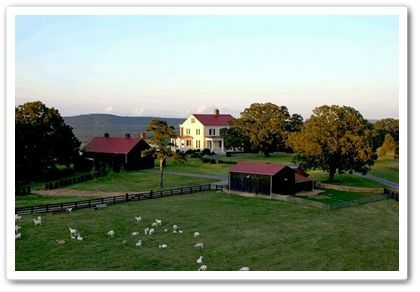 If so, you already know about the exciting event that will be taking place at P. Allen Smith's Garden Home Retreat at Moss Mountain Farm in Little Rock, Arkansas, at the end of April. For those who may not know who P. Allen Smith is, he is a gardener first and foremost. 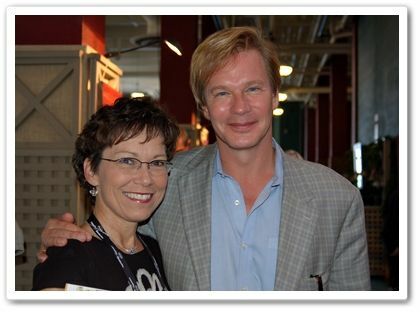 His love for gardening led him to a career in design and host of his own television show, P. Allen Smith's Garden Home, shown on PBS. He's also the author of several books on gardening, garden design, and cooking, including his recent release, P. Allen Smith's Seasonal Recipes from the Garden. He appears regularly on NBC's The Today Show. 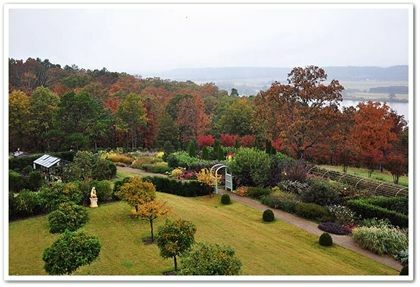 Twenty-four garden bloggers from across the U.S. and Canada will be hosted by Allen for two days in Little Rock, where they will tour area gardens that Allen has designed and spend a day at his 650-acre Garden Home Retreat, where attendees will participate in several activities. 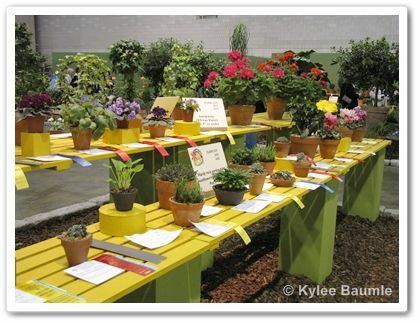 Also in attendance will be some of Allen's Garden Home partners - The Berry Family of Nurseries, Corona Tools, Proven Winners, Stihl, Garden Safe, and Bonnie Plants. When I received my invitation to attend, it goes without saying that I was thrilled beyond words. 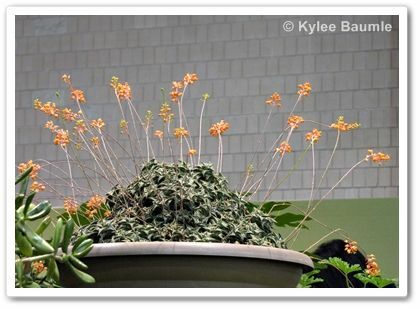 I'd met Allen for the first time at IGC in Chicago last year and was well aware of his position in the gardening world. To be included in this group is quite an honor and I'm looking forward to seeing Allen and his beautiful property and home, as well as interacting with other garden writers, many of whom I've met before and look forward to seeing again. And yes, I'll be taking pictures. We planted carrot seeds last spring, at our usual time. They grew, I thinned them (man, I hate doing that! ), and when they were ready, we dug them and ate them. Then in the middle of summer, we planted a second crop. 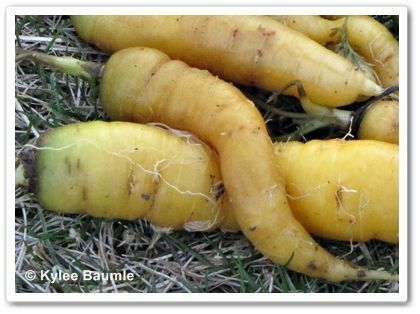 That time, we sowed a mixture of golden and traditional orange carrots. Then autumn came. You know how it is - that time of year brings with it so many yard and garden tasks that sometimes you run out of the time or energy to do them. Sometimes you just forget. Other times, you put them off because you know you can. That's what happened to our carrots. I'd heard that you can leave root crops in the ground even after the ground freezes and that doing so sweetens the flavor. The longer they grow, the higher the sugar content, which also helps protect them from freezing too much. I decided to put that to the test. 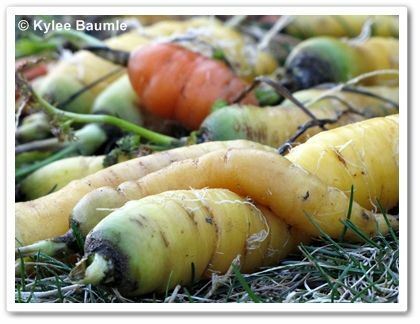 *It's recommended that you mulch root crops heavily if you intend to keep them in the ground all winter, leaving the green leafy tops exposed. We didn't mulch as much as recommended (up to a foot in zone 5! ), but we did put a layer of leaves over the entire garden. We had good snow cover for most of the winter, too, which no doubt helped protect them. 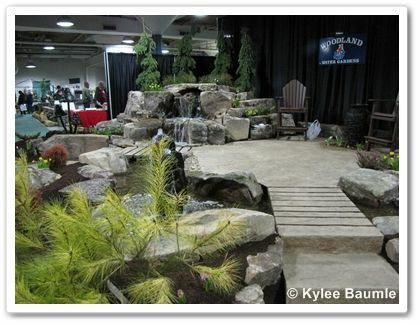 Four flower/home and garden shows in nine days can make one dizzy and delirious with all the landscaping ideas and floral displays. And comparisons can't help but be made, but each of the shows that Mom and I attended had their own strong points. I wouldn't expect any of them to be alike, nor that a smaller town's show would measure up to a major metropolitan area one. 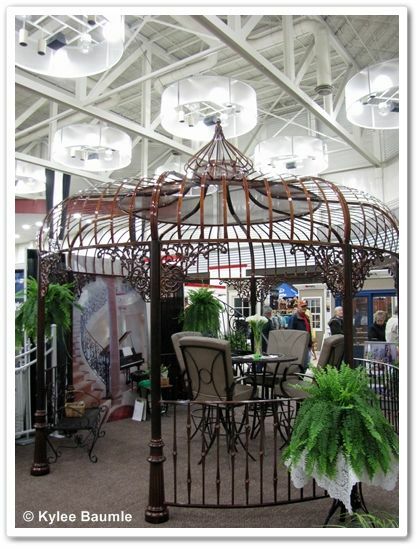 The Fort Wayne Home and Garden Show is usually the first one of the season here. 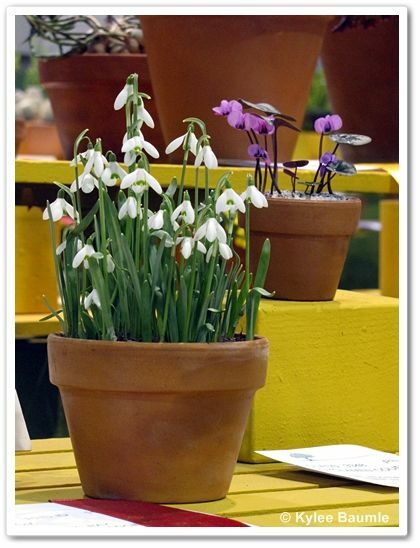 It is long anticipated because once these shows begin, the gardening season follows close on their heels! 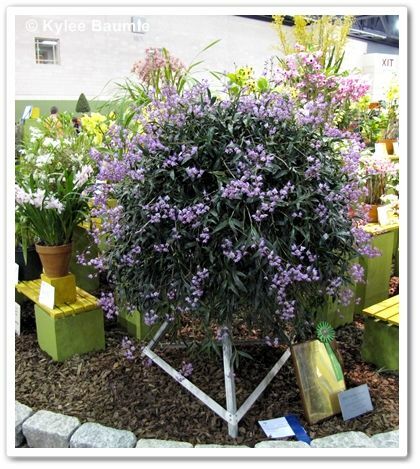 This year's show was as expected - a nice way to spend the day in the company of the fragrance of hyacinths and orchids and seeing a bit of what the local landscapers have to offer. 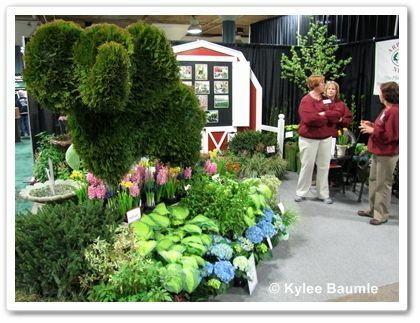 Arbor Farms Nursery did an outstanding job with their display on the right entrance wall to the garden hall. I remember being disappointed with last year's, though I don't remember who was responsible for it. (It wasn't Arbor Farms.) This year, it warranted a closer inspection. 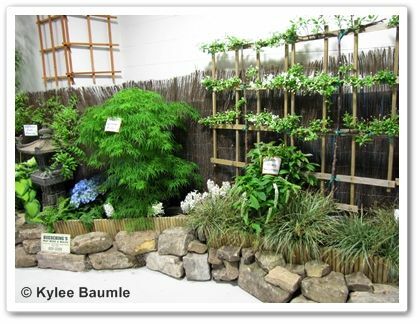 I liked the variety of plants used and the espaliered specimens. 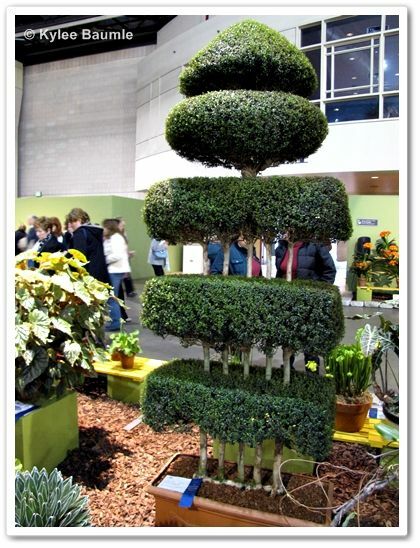 Arbor Farms also had a whimsical elephant topiary at their vendor's booth. They've got other animal topiaries at their nursery and Mom remarked how cute one of these would be in the Children's Garden. The display by Woodland Water Gardens was beautiful, as usual, although it has a similar look every year. 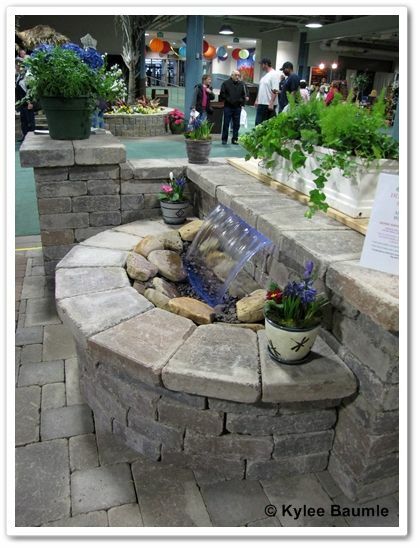 What really caught my eye were the horizontal line waterfall features by Triscape Incorporated. 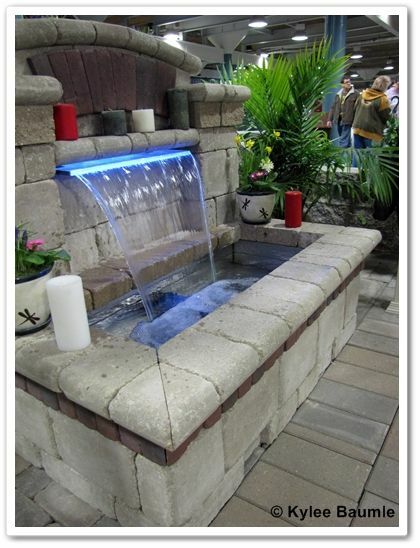 I'd seen a similar waterfall used the day before at the Central Ohio show and would love it if I had a place for one of these. They really were reasonably priced, too. 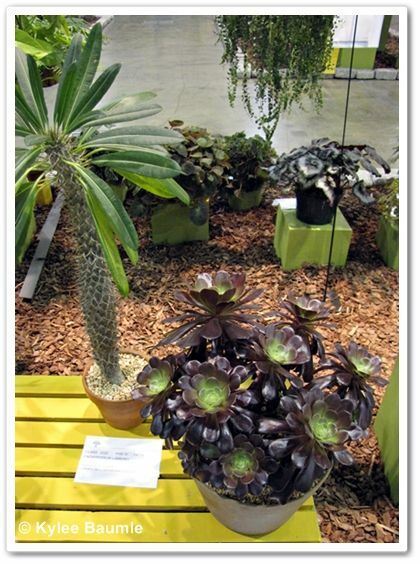 Several garden centers and nurseries were there selling plants, as was the Foellinger-Freimann Botanical Conservatory. The latter always proves to be a wonderful place to buy plants at extremely reasonable prices and once again, my willpower was non-existent as I passed through their booth. 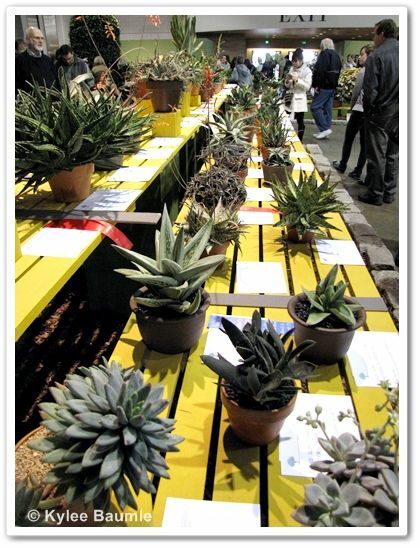 I purchased a yellow jasmine vine, an Agave, a bromeliad, and a couple of Lithops. 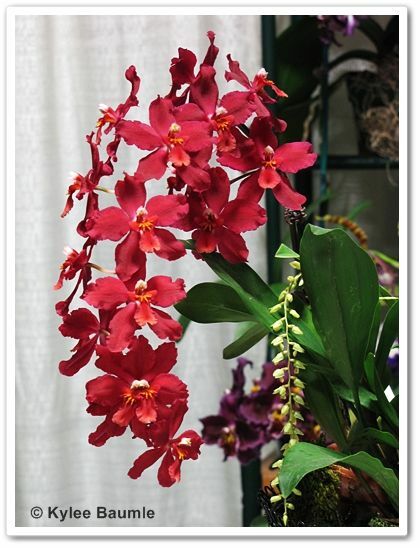 One of my favorite stops each year is the orchid society's booth. 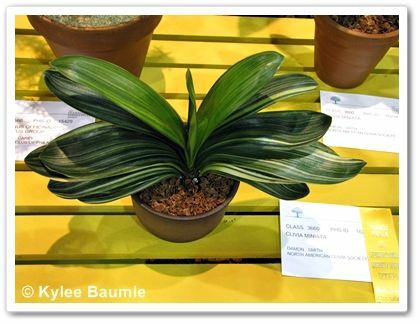 They had several different ones for sale, and although I didn't buy any orchids there, I did come home with three from another vendor - two miniature Oncidiums and a Paphilopedalum. We went over to the "home" part of the show and tasted some of the dips and other food items. I ended up buying some olive oil and balsamic vinegar to mix for salad dressing and to use as a bread dip. I passed these by last year, but shopping while hungry always results in a sale for food vendors. I bought some powdered dip mixes, too. 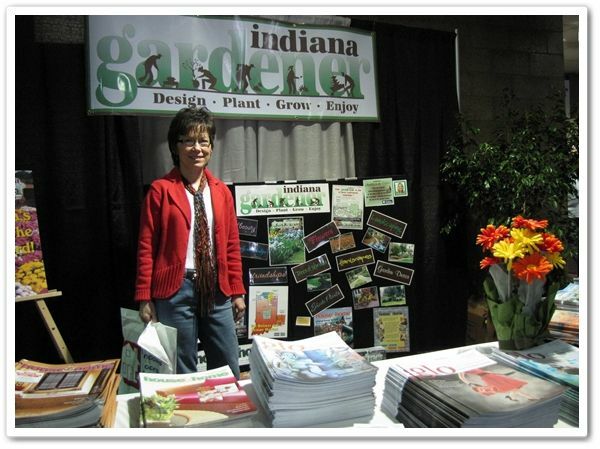 In between the two rooms, Indiana Gardener had a display where they had several of their publications available for the taking. I got to meet the publications manager, Vicky Howell, for the first time. This month's issue features a photo of my forsythia on the cover as well as my article about forsythias. 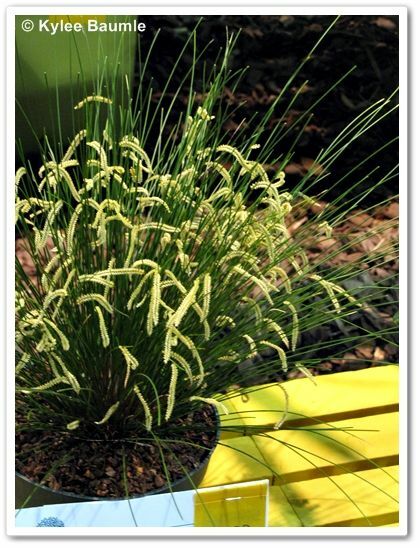 My own garden is the one featured this month, as a part of the "Welcome to My Garden" series (formerly called "Down the Garden Path"). You can read the magazine online here. 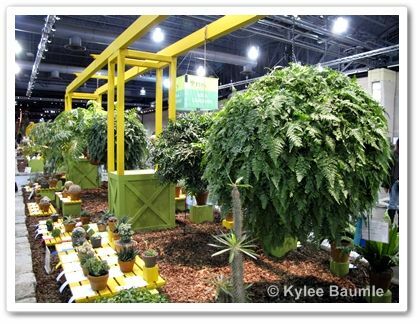 Yet to come: The Chicago Flower and Garden Show and more from The Philadelphia Flower Show! 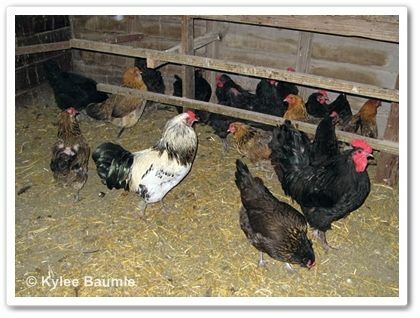 For the last several years, we have helped our neighbors with their backyard chickens. 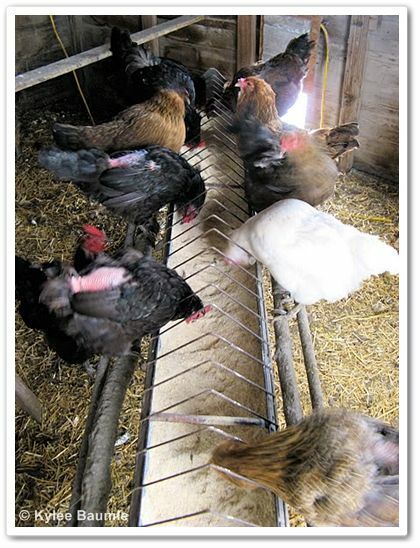 When they take a trip, we feed and water them and gather the eggs. The best part of this is that we get to keep some of the eggs for our own use. Also for the last several years, I've wanted to have a few chickens of our own, but my husband isn't quite as enthusiastic about it. We have the space. 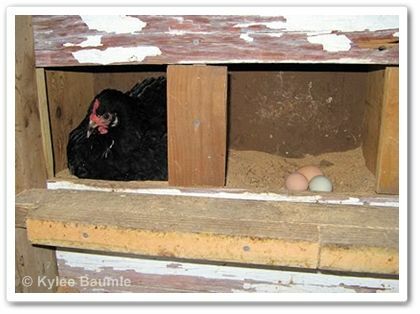 Building a coop isn't a problem. (If he and my dad can build a conservatory, they can surely build a little ol' chicken coop, right?) And the benefit of having our own eggs, which we both love to eat, is a no-brainer. But perhaps I'm missing a compelling reason that would convince him that we should get our own chickens. I only want a few! This is where you, my dear readers, have a chance to help convince him that a few chickens are just what we need around here. In the comments, give your best pitch for us having chickens and I'll lay them on him. 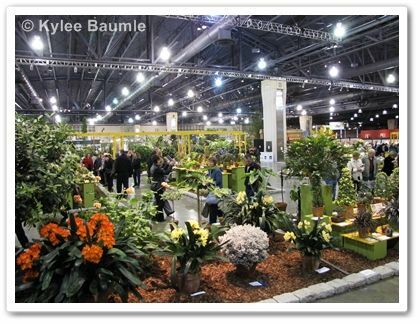 An intriguing part of The Philadelphia Flower Show - any flower show, for that matter - are the specimens that are entered for judging. 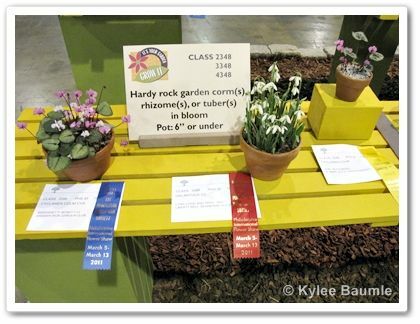 Entrants submit the best of their plants with the hopes of taking home a ribbon denoting theirs to be the best in class or show. 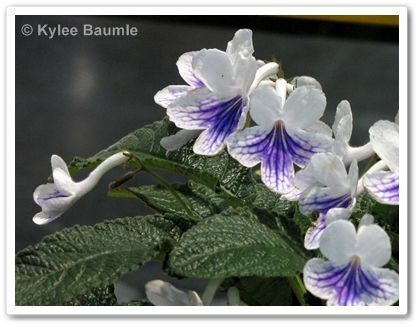 As I walked the aisles of specimen plants, one or two names showed up repeatedly. Mrs. Hamilton, for one. Her reputation had preceded her, as I'd heard my mom talk about her before. Mrs. Hamilton reached legendary status long ago. 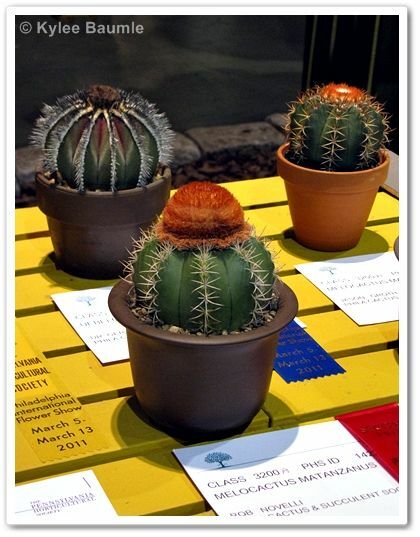 Mom wondered if she would have entries in this year's show. You bet she did and while she didn't win something with everything she entered (a LOT of things! ), she won her fair share. So did Diana Wister. Both Mrs. Hamilton and Ms. Wister had both large and small, and nearly always dramatic entries. You could just about guess which entries belonged to one or the other. What Mom and I wanted to know was how many trucks it took to bring them in, and what their greenhouses must look like. I don't know the age of Ms. Wister, but Mrs. Hamilton is 81 or so years old and surely has staff to help her take care of these things. 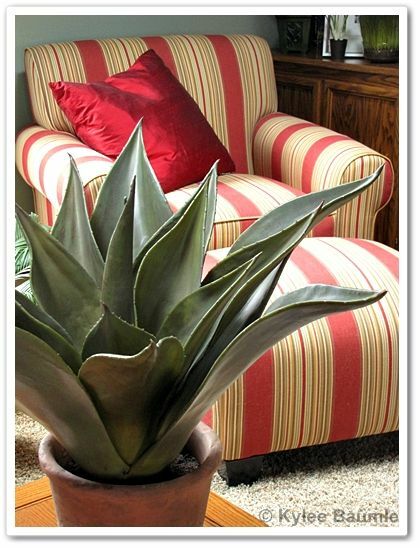 As readers of this blog know, I'm highly enamored with agaves! 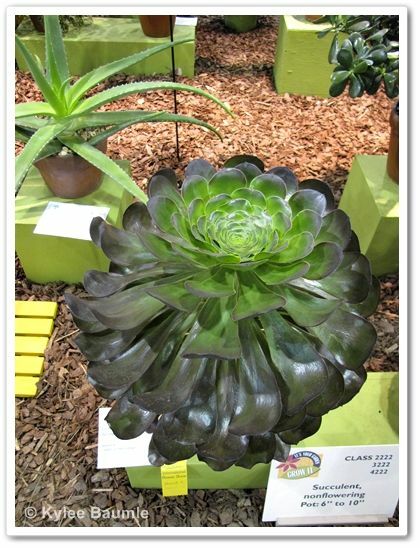 This one is Agave parryi and is one of Mrs. Hamilton's many entries. 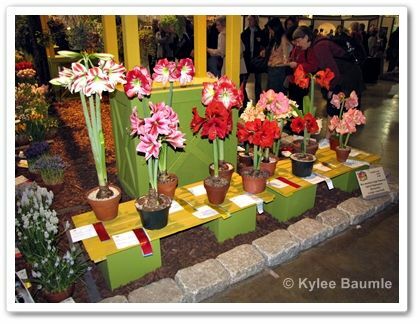 It was Amaryllis heaven, both here in competition and on display (which I'll show in a future post). 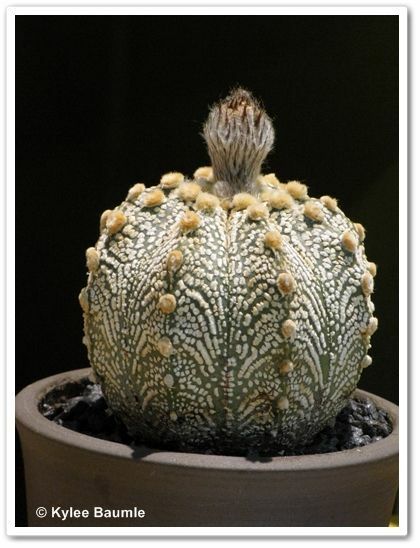 I absolutely LOVED this near perfect specimen of Snowball Cactus (Parodia scopa). It garnered a second place ribbon. 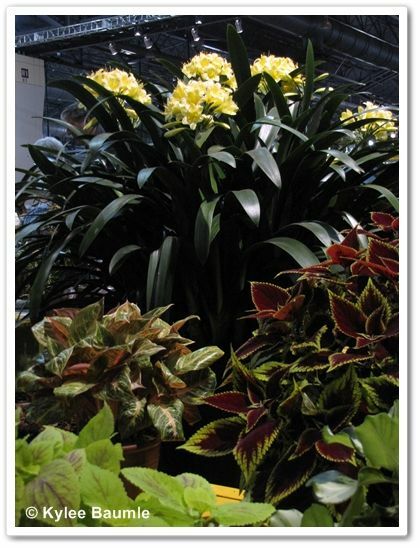 Yellow Clivia, surrounded by Coleus. 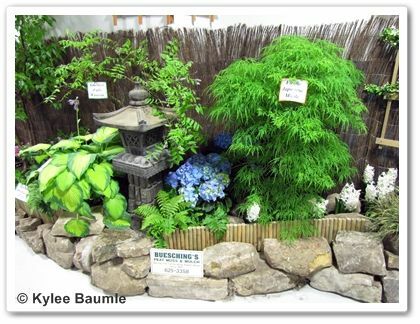 Of several intricate miniature gardens, this one took the blue ribbon. 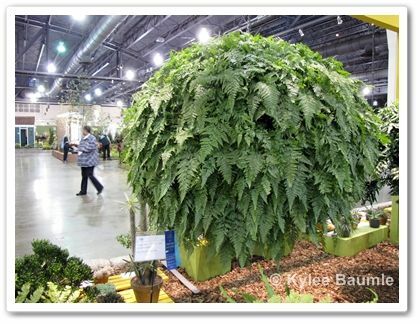 Look at the size of these hanging plants! 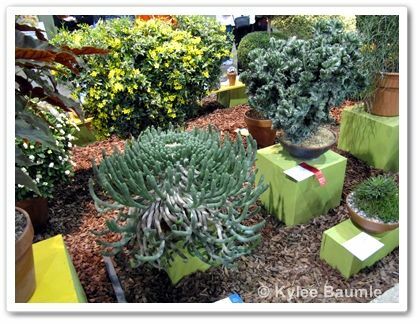 Succulents were getting a lot of attention at the show and rightfully so. 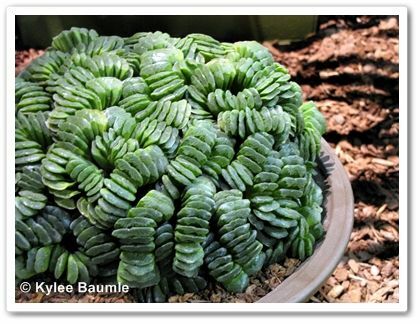 They can be so dramatic, like this Haworthia truncata 'Lime Green'. 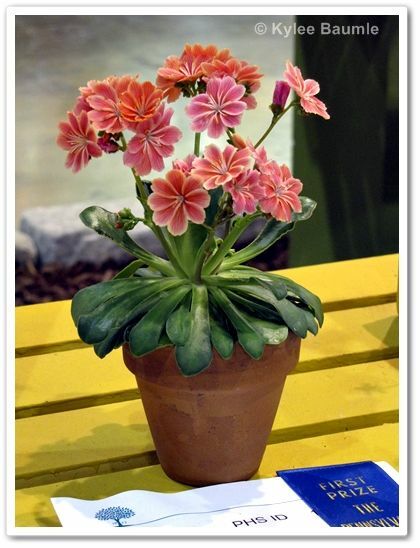 I've grown Lewisia here at Our Little Acre, and LOVE it, but it's very picky about drainage. I have one that's still alive, although it isn't thriving. I got a few blooms out of it last year and it looks like it made it through the winter, so maybe it will bloom again for me this year. 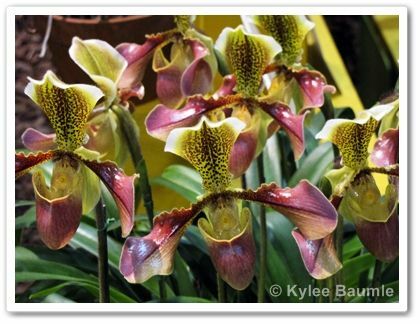 This orchid was the center of attention among the many orchids on display. 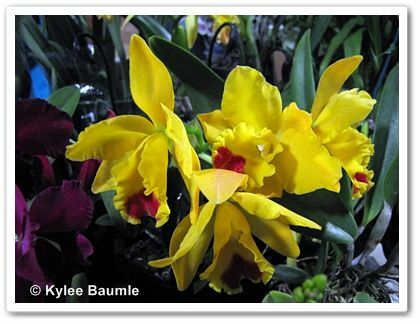 I've never seen one that has a sprayed look to it like this Cattleya Blc. Arabesque. 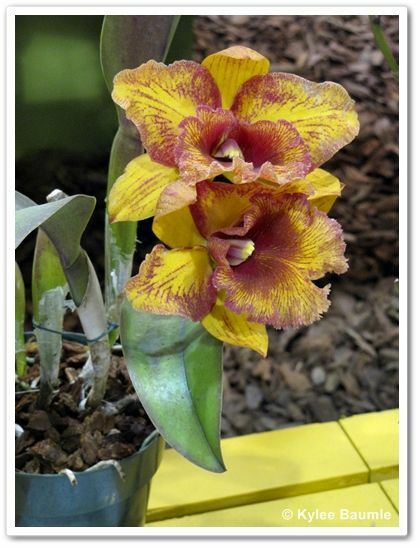 Yes, it's an orchid, but I didn't capture its name. 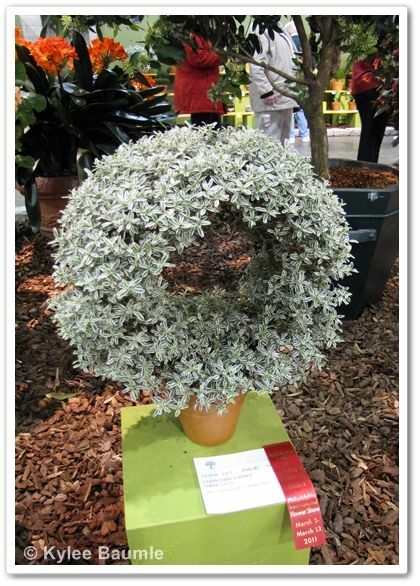 This fabulous Dendrobium kingianum 'Jane Pepper' was a big winner for Mrs. Hamilton. 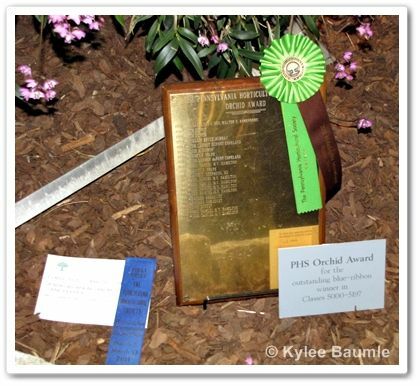 This makes the eighth time Mrs. Hamilton has won this special Pennsylvania Horticulture Society Orchid Award. This gigantic rabbit's foot fern? Mrs. Hamilton's, of course. Another Mrs. Hamilton winner in the Wardian Case category. 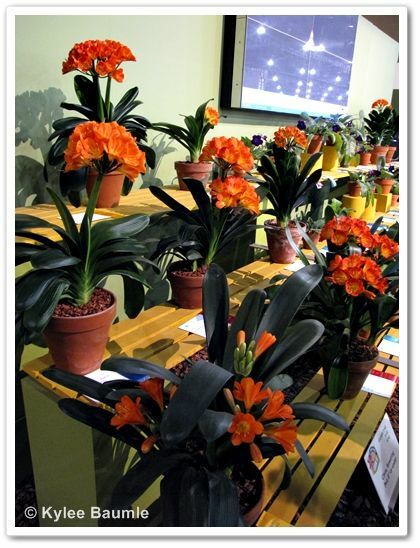 Clivias were a BIG deal at the show, and we saw many of them. 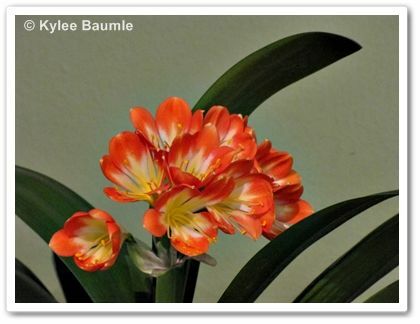 Even Clivias not in bloom were submitted for judging, such as this variegated one.